We exist to foster real-life community, mentorship, and discipleship among women and families through events, book groups and Charlotte Mason co-op communities. It is our desire that you use this website as a means of encouragement and a way to connect with people locally in the Twin Cities. The internet is a great tool for learning, but more important than this is our relationships with one another. So please use this site to find a CM group near you or to find local events to help you as you teach your children. Throughout the ages older women have mentored younger women. Even the Apostle Paul wrote in Titus 2:3-5, "Likewise, teach the older women to be reverent in the way they live, not to be slanderers or addicted to much wine, but to teach what is good. Then they can urge the younger women to love their husbands and children, to be self-controlled and pure, to be busy at home, to be kind, and to be subject to their husbands, so that no one will malign the word of God." Please Join Us for Charlotte Mason Support in the Twin Cities, MN! You are invited to join other thoughtful home-educators, parents, and teachers to discuss the education of children, specifically the methodologies of Charlotte Mason through book study. Each group varies in style and practice. For example, in the Woodbury group, the first hour is a discussion on the reading and the second hour is for support, fellowship, and immersion lessons. See more detailed information on the Book/Support Groups Page. We want families to have support and encouragement in real relationships (and not just online) week in and week out or from month to month! Several areas in the Twin Cities have CM Co-op Communities going. If you'd like to join a current group please check here for groups and contact information! If you would like to learn more and gain help starting your own group in your part of the Cities, please contact us and we can invite you to observe one of our Co-op days as well as help guide you with starting your own group! We feel this is better than driving 45 minutes to an entirely new part of the city. One example of a co-op: the Woodbury, Spread the Feast Community, meets twice a month to study Fine Arts, Nature Study, Shakespeare, and Plutarch using Charlotte Mason's Methods. Please see the Spread the Feast Page for more information. Other groups may have a different emphasis. We are striving to periodically offer Mentoring, Seminars, and Nature Hikes throughout the year to encourage you on your life-long learning journey about God's bounty and Mason's Philosophy. We try to host events throughout the Twin Cities or make them centrally located to the best of our ability. If you see a need for a new location or need support, Contact us! The photo for our site, taken by Heidi Buschbach, is looking down on the little town of Ambleside, England where Charlotte Mason lived and taught in her House of Education. Her home, named Scale Howe, and the Armitt Museum where all her books are stored, are located down at the bottom of the hill in amongst the homes near the smoke rising from the village. The first book we read as a group, back in 2012, was For the Children's Sake, by Susan Schaeffer Macaulay. We derived the name of our discussion group from that book because we are educating truly 'For the Children's Sake'! 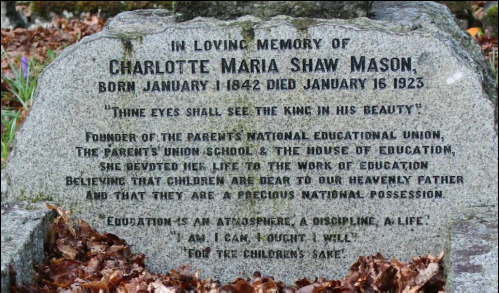 Charlotte Mason used the phrase throughout her volumes and it is on her grave stone as well. Spread the Feast, the name of our Co-op Community, is also a phrase that can be found several places in her volumes. 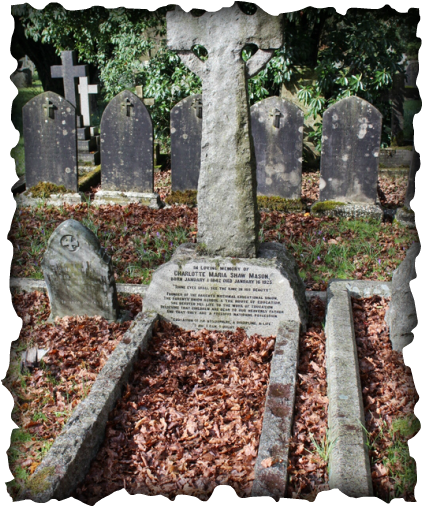 ​March/April 2016, my husband and I attended the Charlotte Mason Institute's England Conference and were able to visit Ambleside, England, Mason's last home and where she was buried.